You know what this week is? 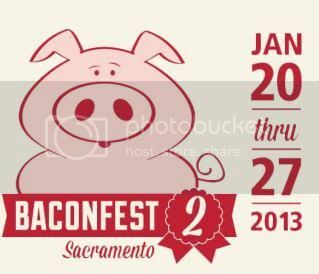 Well, its Martin Luther King Day on Monday - and there is a awesome march happening in Sacramento - which you can check out more info at mlk365.org but its also the Sacramento Bacon Fest. There are some interesting events this week in celebration - like the Kevin Bacon Tribute Night on Friday, Jan. 25 at Old Ironsides, which sounds like the most interesting of all the events. It starts at 8pm and cost only $5. Seems totally worth checking out. Another thing I'd recommend for this weekend if you haven't checked it out yet, is the Art of Norman Rockwell exhibit at the Crocker. We went last weekend and it was packed - like a good museum should be. It'll be around until Feb. 3 so its one of the last few weekends to see it. If you've got kiddos interested in space - you should check out the new Space Quest exhibit at the Discovery Museum. It just opened this weekend - and runs the whole year - so put this one on your list of things to do with the kids when you've ran out of ideas.